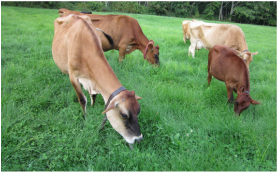 We have a small herd of Jersey and Jersey-Devon cows that are grass-fed and supplemented with a small amount of grain. The grain is certified non-GMO and grown without pesticides, herbicides, or synthetic fertilizers. We are licensed by New York State to sell raw milk, and we welcome visitors to meet the cows and observe a milking any time. Contact us to set up a day. All milk is sold in half-gallon Ball jars out of our﻿ farm store. Milk is $8.50 per half gallon. This includes a $2.50 bottle deposit. If you return a CLEAN AND DRY milk jar with a plastic lid, you can deduct the deposit and pay $6. You may also return additional jars at any time and deduct $2.50 for each extra jar. 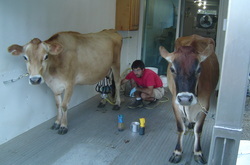 NY State requires that we are able to contact all of our raw milk customers. Send us an email at oldfordfarm@oldfordfarm.com to let us know you are a new milk customer, or you can write your email address on the clipboard in the farm store. If you are buying 3 jars or less, you can come to the store any time and purchase blank milk jars without ordering. Do NOT take milk with someone else's name on them. (These jars are pre-ordered.) There are almost always blank jars available. In the very rare event that we do not have enough milk to keep the store stocked all the time, we will email our customers to let them know (another reason to make sure you give us your email address). If you are buying 4 jars or more, we request that you place an order 2 days in advance. You can have a standing weekly order or just place one-time orders as needed. Email or call with your desired quantity and pick-up day. We will write your name on the jars reserved for you in washable marker. You may pick up your milk any time after 11 AM on your chosen day. If you have a standing order, feel free to change your day and quantity any time (just give 2 days notice). If your milk is not picked up and we don’t hear from you, we will take you off the weekly schedule. It is imperative that your returned jars are impeccably clean and dry. Before filling jars, we sanitize them with a hot-water sanitizing machine. We cannot sanitize jars that are not already clean, so it is the customers’ responsibility to return clean jars. If we find unclean jars, we have to hand-wash them ourselves before sanitizing them. This is a huge inconvenience for us, so please take this seriously. 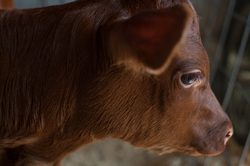 If you are interested in other raw dairy products, consider making your own from our milk. Below is a manual on how to make different dairy products at home, including butter, yogurt, cheese, and sour cream.